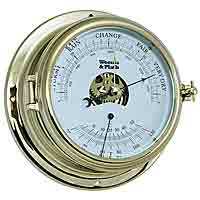 Premium Marine Instruments, Nautical Instruments and Weather Instruments. 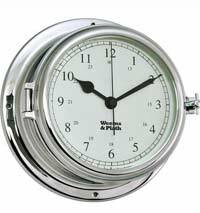 The Clock Depot offers one of the largest inventories of Weems and Plath nautical clocks and weather instruments in the region. Discount pricing and Free shipping is available on all Weems products. 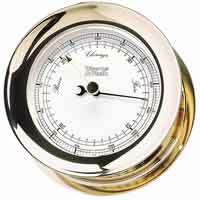 The 201200 Atlantis Thermometer is part of the extensive Atlantis Instrument Collection which features the classic screw bezel and polished forged brass case that is hand polished and flawlessly lacquered. 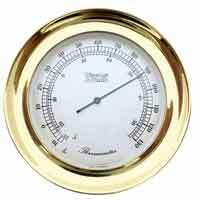 This dial-type boat thermometer includes both Fahrenheit and Celsius scales with markings every 2 degrees from -8 to 130F. Solid forged brass case, polished & lacquered. 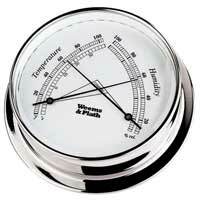 Dial-type thermometer with both Fahrenheit & Celsius scales, marking every two °s from -8 ° to 130 °s Fahrenheit. Pre-adjusted in temperature controlled environment. Instructions & mounting hardware included. 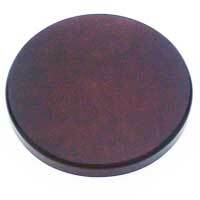 Optional Mahogany finish wood base available separately (100B or 101B) Lifetime warranty on movement and Free Shipping. 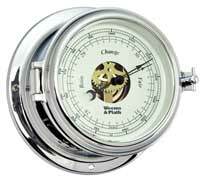 Size: Dial: 4", Overall Width and Height: 5 1/2", Depth: 2 7/8". Weems and Plath Atlantis collection single mahogany finish wood base with back panel model 100B. Fits both Weems and Plath Atlantis and Martinique models. Wt. 2 lbs. Two year warranty and Free Shipping. Size: 4" x 9-1/2" x 7-1/2". 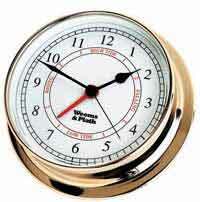 Weems and Plath Quartz (battery powered) traditional Time and Tide Clock. Combination quartz and tide clock movement which averages the Atlantic lunar tide cycle. The tide sector is calibrated for the east coast of the United States. 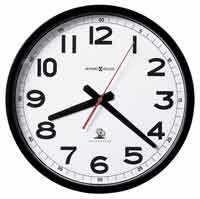 (The clock will work for other tidal bodies of water but will need to be re-set more frequently) AA battery included. Assembled in USA. Weight 3 lbs. 3 oz. Uses 100B Single base. Two year warranty and Free Shipping. The Atlantis Quartz Clock is created from solid, forged brass, hand polished and flawlessly lacquered. Accurate Quartz time only movement. The screw bezel adds the classic nautical look. Provided with complete instructions, mounting hardware, and a fresh battery as required. All instruments carry a limited lifetime warranty and Free Shipping. Size: Dial: 4". Base: 5-1/2". Depth: 2-7/8". 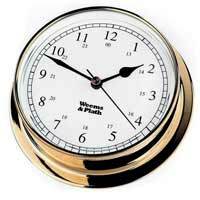 Size: Dial: 4" Base: 5 1/2" Depth: 2 7/8"
Weems and Plath Quartz (battery powered) traditional Time and Tide Clock in a polished chrome finish. Combination quartz and tide clock movement which averages the Atlantic lunar tide cycle. The tide sector is calibrated for the east coast of the United States. (The clock will work for other tidal bodies of water but will need to be re-set more frequently) AA battery included. Assembled in USA. Weight 3 lbs. 3 oz. Uses 100B Single base. Two year warranty and Free Shipping. High quality instruments set in solid hardwood. Brass finish porthole design will never tarnish. 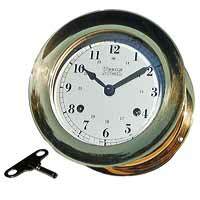 Hinged dial opens after releasing two threaded stops at the 4:00 and 8:00 positions. Full color gift box, battery and instructions included. It is perfect for the home or office and has a lifetime warranty. Scratch resistant sole. Engraveable brass plate for personalization is included for local engraving. 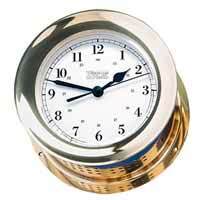 This handsome clock will always look like new because the brilliant brass finish will never tarnish or discolor. 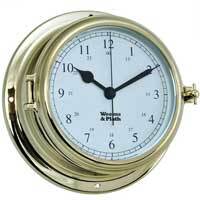 Hinged dial opens after releasing two threaded stops at the 4:00 and 8:00 positions. 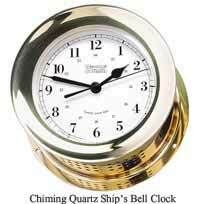 The tambour, sloping style wood base that houses the quartz clock is made of genuine hardwood. The brass feet give it a final touch of elegance and the sole of the base is scuff resistant. 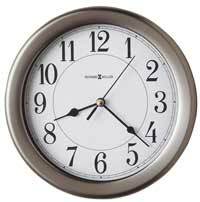 This beautiful clock has a lifetime warranty. 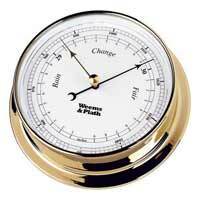 Size: Wid 8" Ht: 5" Dep: 3" , Dial 2 1/2"
Weems and Plath Endurance 125 Time & Tide Clock combination quartz and tide clock movement which averages the Atlantic lunar tide cycle. The tide sector is calibrated for the east coast of the United States. Uses a AA battery. (Note: The clock will work for other tidal bodies of water but will need to be re-set more frequently.) Two year warranty and Free Shipping. Dial: 4-7/8". Base: 6". Depth: 1-5/8". The Brass Endurance 125 Clock features five remarkable benefits never before available in a brass instrument collection. This is a brass instrument that will never need to be touched again except to change the battery! Size: Dial: 4-7/8". Base: 6". Depth: 1-5/8". The thermometer displays temperature in both Fahrenheit and Celsius on the left scale, and the hygrometer shows % of relative humidity on the right. The new Endurance II Analog Clock is light, strong and guaranteed not to tarnish or scratch because of it's maintenance free, ultra-hard protective coating. 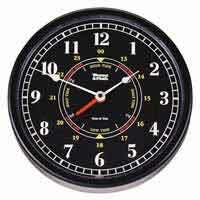 The Endurance II Chrome Clock has an accurate quartz movement and operates on one aa battery. The dial face opens with your traditional porthole front opening bezel with a Beveled glass crystal to protect the dial. Flanged back provides a mounting methods wall, boat or display as a table clock with our 135SM single wood base in mahogany finish sold separately. Lifetime warranty on finish and movement and Free Shipping. Three brass instruments are mounted on a solid mahogany plaque. 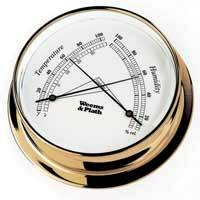 The easy-to-read instruments are a quartz clock, a barometer, and a comfortmeter which is a combination thermometer/hygrometer. Mounts vertically or horizontally. Made in Germany. Size: 12" x 4 1/4". 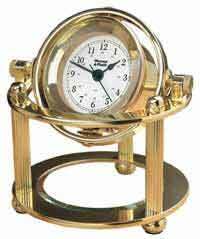 Polished brass and lacquered gimbaled quartz clock swivels for any viewing angle and can be locked in place. Stands on three brass legs. Beveled glass crystal below clock. Brass plate for engraving and an "N" battery included. Free Shipping. Size: 4.624" x 5.25" x 5.25". Light, strong and durable, the Endurance II Quartz Clock in brass finish features a front opening porthole style case, housing an accurate quartz time movement and easy-to-read dial. 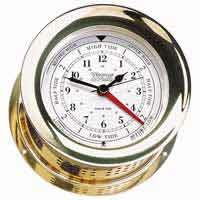 Constructed of the same high luster, maintenance-free, ultra-hard finish that is a hallmark of the original Endurance collection, this nautical, weather resistant clock is guaranteed to never tarnish. Maintenance free, ultra-hard protective coating. Traditional porthole front opening bezel. Mounting methods for boat or shore. 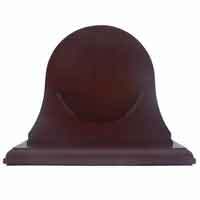 *Single wood base in mahogany finish available separately (135SM). Lifetime warranty on finish and movement and Free Shipping. 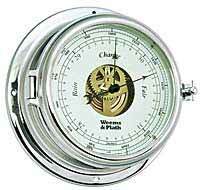 The Weems and Plath Trident is a combination time and tide clock movement which averages the Atlantic lunar tide cycle Tide sector is calibrated for the east coast of the United States. The Trident is an easy-to-read tide and time wall clock featuring a matte black case with red, white, and black dial graphics and a flat acrylic cover. The dial features Arabic numerals and white hands. A red tide hand indicates the approximate tides for the Atlantic Ocean. Accurate quartz movement operates on 1 AA battery. (Note: The clock will work for other tidal bodies of water but will need to be re-set more frequently. )Two year warranty and Free Shipping. Size: Diameter 10-1/4". Depth: 2-3/4." 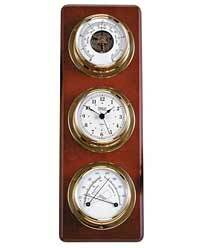 Citation Dual Plaque for Ships Clocks and Barometers in a lacquered mahogany finish. This beautiful wood citation plaque enhances the display of two brass or chrome instruments. The plaque can be mounted horizontally on a wall or boat bulkhead. 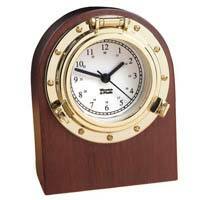 Single Plaque for Ships Clocks and Barometers in a satin mahogany finish. This beautiful wood plaque enhances the display of one brass or chrome instrument. The plaque can be mounted horizontally on a wall or boat bulkhead.